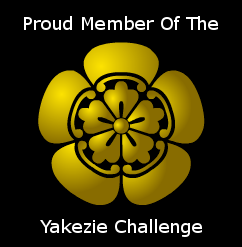 Today, to show that I am back in the saddle, having completed some major projects and life tasks this past month, and ready to press forward here on Personal Finance Firewall, I have joined the Yakezie Challenge. The Yakezie Challenge was started by Financial Samurai to help bloggers network in a very nonexclusive way and help them get to know and help each other to reach a common goal. That goal is to improve. For me, this challenge is not about winning a prize or getting public recognition but more about improving your experience here and my relationships with others in the community, be it readers or fellow bloggers. Now it’s true that I could do all that without joining this challenge, but there are several advantages to doing things this way. First, I will be part of a group with a common goal. That factor alone already increases my chance to succeed (remember that old analogy about ripping a single piece of paper vs trying to rip a phone book in half). Second, the challenge ranking is based on Alexa web rank which, from what we know about the Alexa ranking algorithm, is based on content and post frequency as well as numerous unknown factors, but it is one of the most granular ways(rankings are based on a huge number, versus Google Pagerank which is a 0-10 scale where it’s hard to see small improvements) we have to track ranks on the web. This will make it easier to see improvement. My plan in the area of content and post frequency is to post on a more regular frequency. I don’t plan to post more often than 3-4 times a week but I want to be consistent. I also plan to prepare further ahead of time so I can create better content that’s worth reading. I’ve been blogging for just over a year now and I have grown tremendously in many ways since I started this blog, but it’s about time I started striving to improve this place for you and using that improvement to help others improve and grow as I have. Alexa basically ranks you based on the number of visitors, and not so much how much content you have or your post frequency. Although, the more posts, the more people will read etc. Hope to see you around the sphere, and pls ping Daniel-san and Greg-san from Sweating The Big Stuff and Eliminate The Muda that you’ve joined! Joel-san at Credit Card Chaser too. Love the phone book analogy. I didn’t want to get into the technicalities of Alexa in the post 🙂 , but like you said, the more posts, the more people see them, thus improving the rank. I will get in touch with those you mentioned, and great work for starting this challenge. I look forward to working with the already strong network you have created. That’s awesome!! Good luck and can’t wait to see what you have in store for us! .-= Amanda´s last blog ..Recipe Thursday: The Best Cheeseball =-. Thanks Amanda, I appreciate your support. .-= Jeff @DeliverAwayDebt´s last blog ..Net Worth â€“ March 2010 =-. 🙂 Thanks Jeff, it’s nice to be missed. I was really started to itch from Twitter withdrawals there hah thanks for waiting, I have some pretty good stuff in store for you guys coming up this week..
Good to see you joining the Yakezie! .-= Derek Clark´s last blog ..Blueprint For How To Make Money With A Blog â€“ Review =-. Derek, thanks for the warm welcome! Glad to be a part of it.